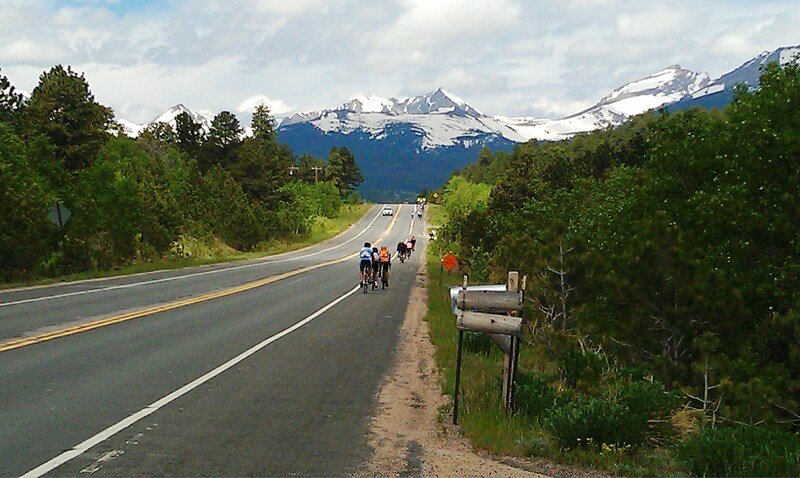 Central City to Estes Park, 57 miles. We venture along the Peak to Peak highway to Estes Park. No mountain passes today but lots of up and down, including 5,000′ ft. of climbing with many miles of 6-7 and even 8% grades. There was a lot of heavy breathing on this ride. I was getting kind of excited when I realized it was just me! This was a tough beginning for flatlanders from Florida, me and my co-riders brother Dan and Kevin Moore both from the Chicago area. Disclaimer: I had just 2 weeks to train coming off a fractured pelvis and had to fly in from a business trip in RI. This was probably the hardest physical challenge I have had to face in a long time. Tomorrow, weather permitting, we climb for 25 miles to over 12,000′ over the Trail Ridge Road through Rocky Mountain National Park. I’ll post a couple more pictures on Facebook. Beautiful scenery . . . I hope your “brane” recovers overnight!! I am amazed that you are taking on this challenge so soon after your injury. Take care of your big brother! Hugs! !